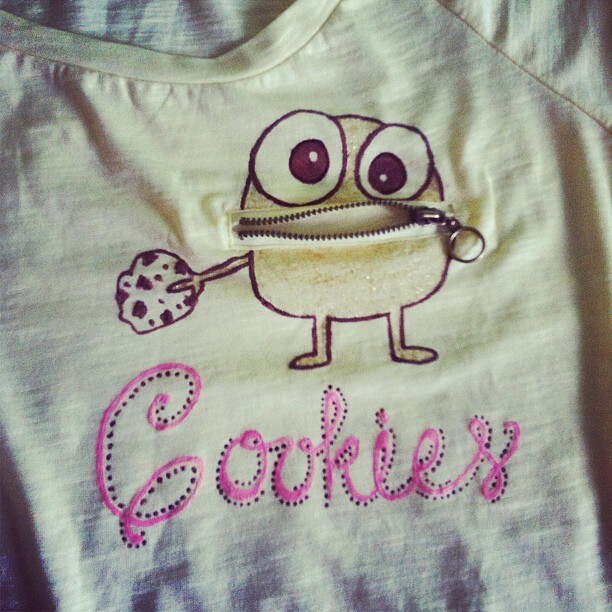 Cookie Monster with “Cookies” caption hand painted in brown and pink on light yellow cotton t-shirt. Zip detail. This just in; Ekin creates this ‘order’ in the lack of a plain t-shirt ! Luckily it turned out great and the client loved it 🙂 The pocket detail was a minor one, and I thought I could still pull of a little line *and* have a great design in the front. But I didn’t want any fuss at any point of the shirt, so I thought “why not include it in the design?” The zip acted like a cute mouth to the monster and It made the client want to throw some actual cookies in! At least that’s what She said !! Cr(owl)ded ! More owls, more fun! Beauties From Istanbul Madonna Concert!